My mom and my sister really wanted to eat Aburi Salmon Oshi Sushi after hearing me rave about Green Leaf Sushi. Since Green Leaf Sushi was a long drive for us, I suggested that my dad drive us all to Victoria Sushi instead, another restaurant from which I had had excellent Aburi Salmon Oshi Sushi. However, when we got to Victoria Sushi, we saw several police cars and a policeman hurriedly exiting the restaurant. A helicopter whirred noisily over our heads. Despite all the commotion, my mom still wanted to eat at Victoria Sushi. However, the rest of us did not want to be the cat who was killed by curiosity, so we headed towards Uptown New West. The Tuna and Salmon Sashimi came in huge slices, and the sashimi was undoubtedly fresh. 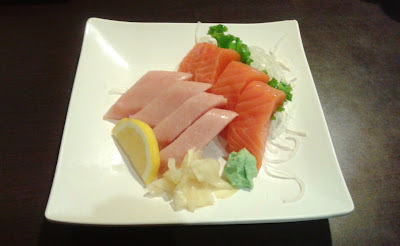 The Salmon Sashimi had an enticing buttery flavour and a smooth texture. However, both types of sashimi were a bit chewy, and there were a few tendons scattered among the pieces of tuna. One of the combos on the front page was a Mix & Match Combo, which allowed you to choose three items from a list for $9.95. However, for me, picking the three items was like answering an interview question - after eons in deep thought, I still had no idea how to proceed, and everyone around me started to get impatient. My mom took over and whimsically suggested the Spicy Tuna Roll. 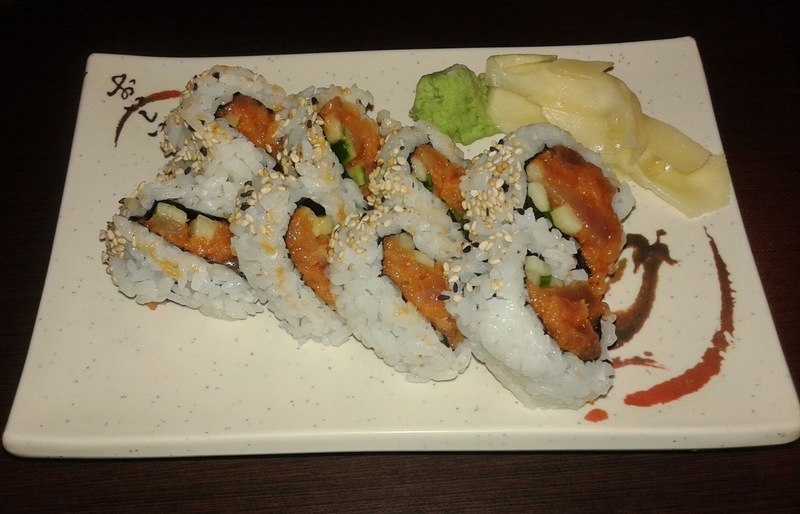 The Spicy Tuna Roll tasted surprisingly good! Loaded with just the right amount of spice, the tuna was soft and melty, and its flavour was accentuated by the sesame seeds sprinkled on top. 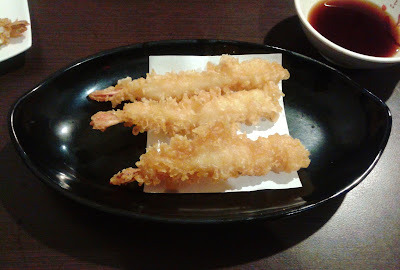 The prawn in the Prawn Tempura had a decent rich flavour, but the frying oil for the tempura was evidently overused. As a result, the prawn was overly hard and crunchy. 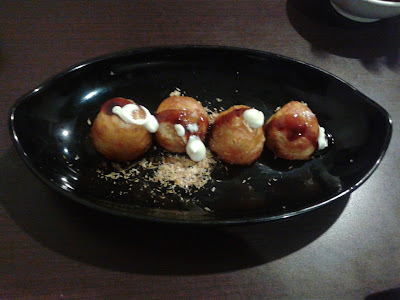 Each of us had one piece of Tako Yaki, but I ate mine too quickly and had to temporarily eject it from my mouth to avoid burning my tongue since it was served very hot. However, I suspected that the Tako Yaki was otherwise very good, and my sister and my dad both gave it an A, which confirmed my beliefs. The flour filling was very soft, and the exterior had just a hint of crispiness. The piece of octopus was well-flavoured and had a good amount of chewiness. 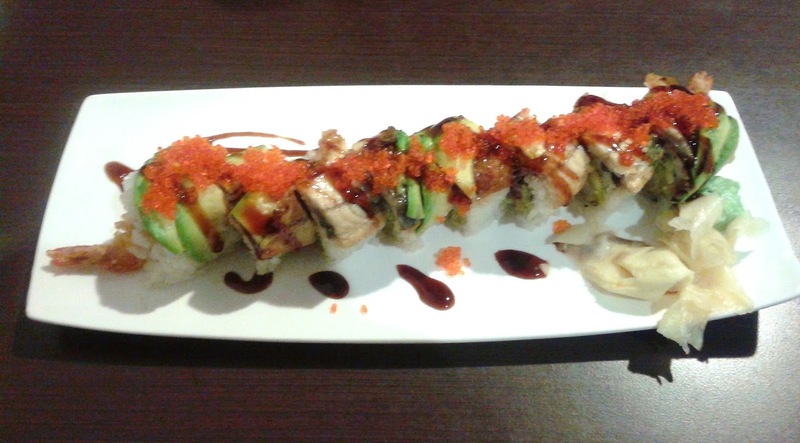 The Dragon Roll consisted of prawn tempura, avocado, cucumber, tobiko and unagi. 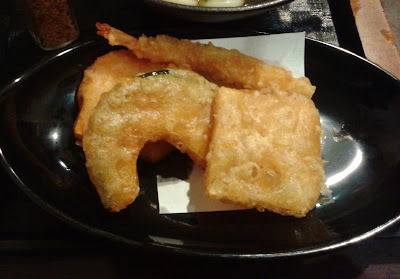 Other than the frying oil issue for the prawn tempura, the roll was well-constructed. The unagi was savoury, and the avocado was fresh while rich in flavour. Overall, there was a good harmony of flavours. Next, the Combo A arrived. This was a lot of food for just $8.99! 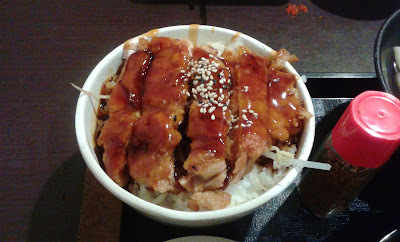 The Chicken Teriyaki Don was nicely pan-fried and dressed with ample teriyaki sauce. The chicken was tender, and the skin was crispy and delicious. The Combo A came with one piece each of prawn tempura, yam tempura, kabocha tempura, and sweet potato tempura. My dad got out his handy dandy pair of scissors so that I could try a bite-sized piece out of each one. Again, the batter was unappetizingly hard. Out of all the pieces, the yam was the best, being sweet and sufficiently moist. We were all happy to let my sister have a few extra pieces of tempura as she seems to be fine with tempura of any quality. The Udon worked well as a filler to conclude the meal. The dashi broth was a bit mild, but it had a heavy essence of kombu. 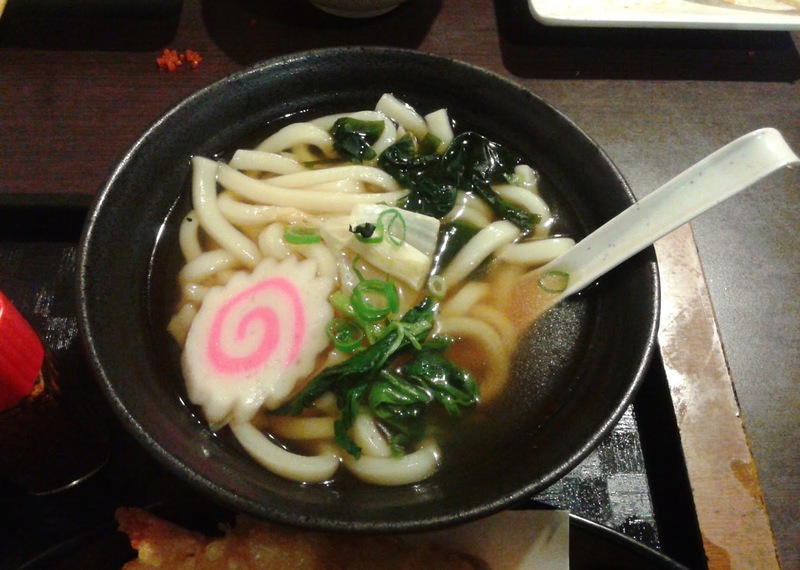 The udon noodles were on the softer side. One of the most remarkable parts of the meal was the bill. For all that food, the bill was under $40 (before tips). 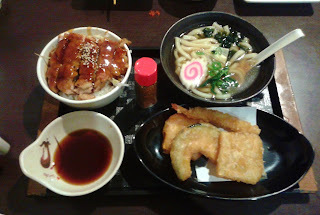 With the exception of the tempura, the food was quite well-prepared, especially for the price range. The service was sparse, but our server tried to be friendly. For a restaurant we just randomly stumbled into, we were all satisfied with our dinner. 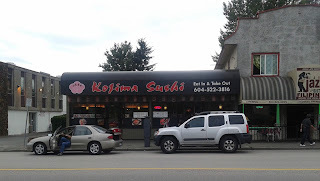 Funny enough, my mom mentioned going to Victoria Sushi again as I type this post. She must have contracted my addiction to Aburi sushi!